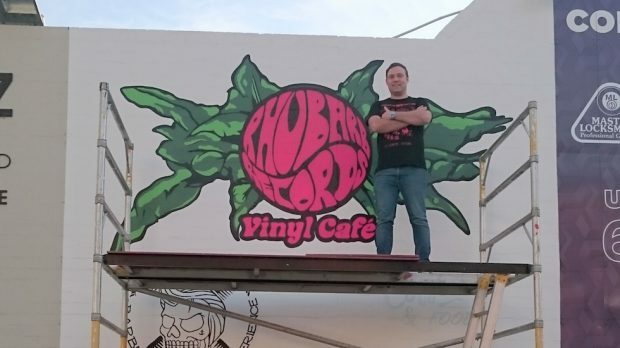 Rhubarb Records has announced they will be opening a new ‘vinyl cafe’ in Leederville. It’s set to be a great new destination for everyone that loves vinyl and especially local music. It shows a remarkable growth in the business that has become popular in it’s current store in Victoria Park for it’s support of local music, holding live shows, in house performances and pressing their own compilations of local bands in their Rhubarb Jam releases. The new store is set to join with Billy Black’s Barbering Experience at 18b/663 Newcastle Street and opens its doors Saturday, November 4. BRAYDEN EDWARDS caught up with the man with the plan Dylan Sainsbury to talk about the new venture. Where did the idea for this come from and why did you think it was something good to go for? I’ve wanted to do something like this for a long time but was unable to get permission at my record store in East Vic Park to serve food and coffee. So when Scott from Billy Black’s Barbering Experience told me that the café/retail space was available I didn’t waste any time catching up with him to discuss the opportunity. A few days later I was signing the lease. I have a really good feeling about the space and the location. It’s going to be hard work but I’m ready for it. I already run a record store as you’d know and I worked as a chef for seventeen years so this is really an opportunity to combine my two passions. What kind of space do you want this to be? I want to create a relaxed place for music lovers and vinyl collectors to meet and hang out with people who share the same interest. We sell and promote a lot of local music at our store in East Vic park and through our record label. The new café will enable us to take that to the next level because we’ll have space for live music on weekends. Rhubarb Records in East Vic Park will stay the same and have the larger vinyl selection plus the hi-fi and accessories while the Leederville Vinyl Café will have a fresh selection weekly, with stock on rotation between the two stores. We have space to stock over 1500 titles in Leederville and there will be both new and second hand vinyl. What is special about Rhubarb records and what makes it different from other record stores? Firstly, we just get the basics right. Friendly and personable service, realistic prices on our new and used records, attention to detail; for example all our used vinyl is cleaned using a Spin-clean, plus a really good selection with plenty of records that you won’t see around very often. As well as the basics we run a record label with several albums under our belt as well as a compilation series called Rhubarb Jam which focuses on Perth’s independent music scene across a range of genres. We also set up a company called XVinylX for vinyl manufacture and now work with some great bands and labels from all over Australia. Any chance of some little live shows there? Hell yes! Once we’ve had a week or two to settle in with the new team we’ll get some live music events happening. It’s going to be a lot of fun!